Fast and Easy.... is the name of the game. I am always running around the house right as we are leaving to go out with friends trying to find the perfect little card or handmade gift item. Even worse this time of year. These are so great when you are out the door with a gift in hand. 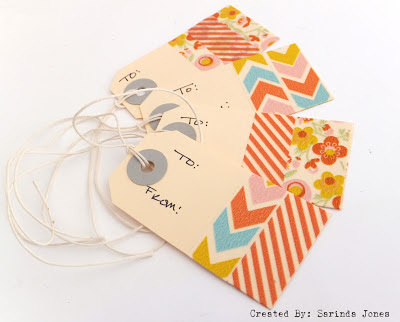 Grab a tag.... wrap tape around to other side.... Cut. Add a to and from... DONE-! TIP: These are great for your wine bottle gifts.